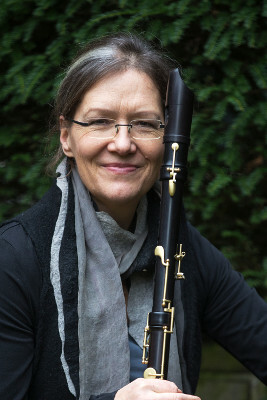 Adriana Breukink studied recorder at the Royal Conservatoire of the Hague with Frans Brüggen and Ricardo Kanji. In the final year of her studies she learned to make recorders from Fred Morgan in the workshop of the Conservatory. After her soloist exam she started making Baroque recorders and a Ganassi-type recorder developed by Fred Morgan. The wide bore of this Renaissance recorder inspired her to develop other wide-bore recorders. For the Moeck firm she developed in 1997 the Slide-Flute, a Ganassi-based recorder with a chin-controlled dynamical slide extension. After 1999 she developed in cooperation with the Mollenhauer firm the Dream Recorder series. Recorders in this series have a wider bore and bigger fingerholes that makes it easier for children to play than the more narrow Baroque model that has been the age-long standard for. In 2007 she started the development of the ‘Eagle’, a completely new concert recorder. This development started with some simple models to explore how the design of recorder characteristics can be adapted and matched to a player’s breathing characteristics. The basic assumptions were the breathing power of the player and his or her inhaling and exhaling behavior that can differ from player to player but nevertheless some basic principles (see the article on this website). With support and creative ideas of Geri Bollinger and Küng Blockflötenbau the Eagle concert recorders with an E-foot extension became in 2012 available to players. In 2015 she brought her newly developed Eagle Soprano recorder on the market. The first ones are now played by, among others, Dan Laurin, Piers Adams and Michala Petri. Being an active recorder player herself helps to develop top instruments. She is active as player in the Bassano Quartet and as soloist. With the Bassano Quartet she recorded on CD a Spanish programme called “Torres Del Alma” and also, more recently, together with Daniel Brüggen, the CD “Eagles & Seven Tears” Dowland Lachrimaes on consort instruments and other pieces performed on Eagles and Dreamrecorders.